Chairman of Delta State Oil Producing Areas Development Commission, DESOPADEC,Hon. 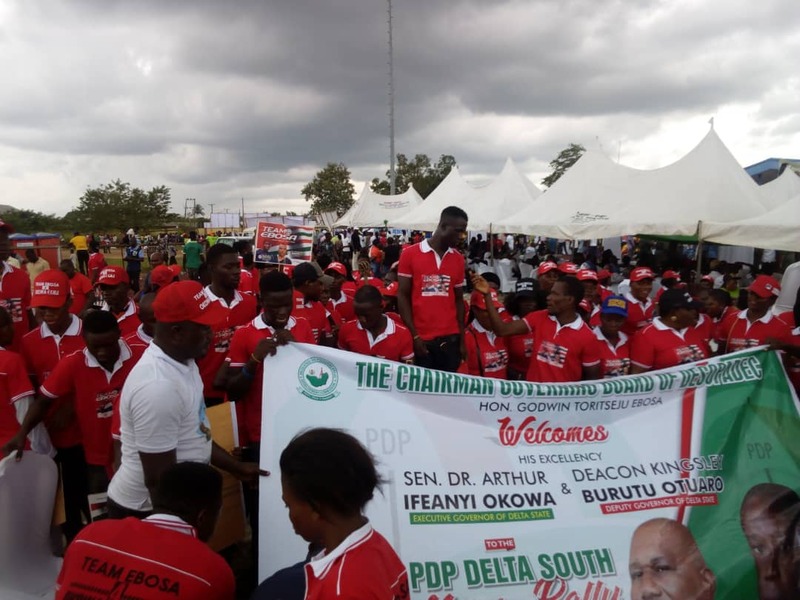 Godwin Toritseju Ebosa, has rallied support for the re-election of Delta State Governor, Dr. Ifeanyi Okowa and the Senatorial ambition of Hon. Michael Diden, popularly known as Ejele. The DESOPADEC Boss and former chairman of Warri North Local Government Area who mobilized scores of his supporters to Oleh, Isoko South Local Government Area, Saturday June 9 for the PDP Delta South Mega Rally in a message made available to Fresh Angle International through a loyalist, asserted that Deltans should vote for Governor Ifeanyi Okowa in 2019 to enable him continue his massive infrastructural development strides and human capital empowerment programmes geared towards job as well as wealth creation. Hon. Ebosa called on Ijaws, Itsekiris, Isokos and other inhabitants of Delta South Senatorial district to support the 2019 senatorial ambition of the member representating Warri North Constituency in Delta State House of Assembly, Hon. Michael Diden. According to Ebosa, Hon. Diden is a servant of the people who will carry everyone along if elected to represent Delta South at the National Assembly.